Liczba stron: 115 Jest to ujednolicona liczba stron, która ułatwi Ci porównanie długości książek. Każda strona Legimi to 200 słów. You will never look at cancer the same.The must-read summary of "The Emperor of All Maladies: A Biography of Cancer" by Siddhartha Mukherjee. This book chronicles a fascinating "biography" of cancer—from its first documented appearance five thousand years ago through the battles in the 20th century to cure, control, and subdue it, to a new understanding of its biology. It recounts the centuries of discoveries, successes, and failures in the cat and mouse battle against cancer, bringing cancer research and cancer biology to the lay public.This guide includes:	Book Summary—The summary helps you understand the key ideas and recommendations. Online Videos—On-demand replay of public lectures, and seminars on the topics covered in the chapter.Value-added of this guide:	Save time	Understand key concepts quickly	Expand your knowledgeRead this summary to get an informative overview of the evolution of healthcare and health research, in addition to the specific history of cancer. 3. Will You Turn Me Out If I Can't Get Better? Limit of Liability/Disclaimer of Warranty: The publisher and author make no representations or warranties regarding the accuracy or completeness of these contents and disclaim all warranties such as warranties of fitness for a particular purpose. The website addresses in the book were correct at the time going to print. However, the publisher and author are not responsible for the content of third-party websites, which are subject to change. To my wife, Lillian, who is the source of energy and love for everything I do, and to Andrew and Amanda: watching you grow up has been a privilege. For a complete list of books by Lee Tang and information about the author, visit https://lmtpress.wordpress.com. The book chronicles a fascinating "biography" of cancer—from its first documented appearance five thousand years ago through the battles in the 20th century to cure, control, and subdue it, to a radical new understanding of its biology—its essence. The book recounts the centuries of discoveries, successes, and failures in the cat and mouse battle against cancer, bringing cancer research and cancer biology to the lay public. Siddhartha Mukherjee is an assistant professor of medicine at Columbia University and a staff cancer physician at the CU/NYU Presbyterian Hospital. A former Rhodes scholar, he graduated from Stanford University, the University of Oxford (where he received a Ph.D. studying cancer-causing viruses) and from Harvard Medical School. This guide is a summary and not a critique or a review of the book. It does not offer judgment or opinion on the content of the book. This summary may not be organized chapter-wise but is an overview of the main ideas, viewpoints, and arguments from the book. It is NOT meant to be read as a replacement of the book which it summarizes but, instead, a supplement for review of the book's main premises and to provide commentary and additional resources. In the laboratory buried in the basement of the Children's Hospital in Boston on a December morning in 1947, a man named Sidney Farber waited for the parcel from New York to arrive. There were no patients in the lab here, just the bodies and tissues of patients brought down for autopsies and examinations. Farber was the chief of pathology at Children's. For Farber, pathology was a discipline more preoccupied with the dead than the living. Now felt impatient watching illness from its sidelines, Farber would try to treat patients in the clinic upstairs. He would try to use the knowledge from his pathological specimens to devise new therapies for diseases. The parcel from New York contained a few vials of a chemical called aminopterin which he hoped might stop the growth of leukemia in children. Had Farber asked any doctors in the clinic upstairs about the likelihood of developing an anti-leukemia drug, they would have told him not to bother. Childhood leukemia had confused and frustrated doctors ever since its discovery on March 19, 1845, by a Scottish physician named John Bennett. The patient was a 28-year-old man with a mysterious swelling in his spleen. In a few weeks, the patient had spiraled from symptom to symptom - fevers, flashes of bleeding, sudden abdominal pain, swollen tumors spouting in his armpits, and his neck. Bennett treated him with leeches and purging, but to no avail. At the autopsy, Bennett concluded that his patient had succumbed to an infection because his blood was full of white blood cells. He called his case "a suppuration of blood." Four months later, a young German professor at the University of Wurzburg named Rudolf Virchow published a similar case. The patient's blood was overgrown with white blood cells, forming dense and pulpy pools in her spleen. At autopsy, Virchow found layers of white blood floating above the red. He called the disease "weisses Blut" - white blood. In 1847, he changed the name to "leukemia" - from "leukos", the Greek word for "white". Virchow was a pathologist in training. He believed all living things were made of cells. And that cells could grow in only two ways: either by increasing its number or by increasing its size. He called these two modes hyperplasia and hypertrophy. Examining cancerous growths through his microscope, Virchow concluded that cancer was hyperplasia in its extreme form. By the time Virchow died in 1902, a new theory of cancer had come together out of these observations. Cancer is an aberrant, and uncontrolled cell division creating "tumors" that would attack and destroy organs and normal tissues. These tumors could also spread (or metastasize) to other parts of the body, such as the lungs and the brain. Leukemia is a malignant overgrown of white cells in the blood. It comes in several forms. It could be chronic and indolent, or acute and violent. The second version comes in further types, based on the white blood cells involved. Cancers of the myeloid cells are called acute myeloid leukemia (AML); cancers of the lymphoid cells are called lymphomas; cancers of immature lymphoid cells are called acute lymphoblastic leukemia (ALL). The most common leukemia in children is ALL. SIDNEY FABER, THE third of fourteen children, was born in Buffalo, New York, in 1903. His father, Simon Farber, had immigrated to America from Poland in the late 19th century and worked in an insurance agency. Having completed his advanced training in pathology in the late 1920s, Farber became the first full-time pathologist at the Children's Hospital in Boston. His specialty was pediatric pathology, the study of children's diseases. Yet Farber was driven by the hunger to treat patients. Sitting in his basement laboratory one day in the summer of 1947, he was inspired to focus his attention to the oldest and most hopeless variants of leukemia - childhood leukemia. The disease had been analyzed, and classified meticulously, but with no therapeutic or practical advances. The package from New York was waiting in the laboratory that December morning. As he pulled out the vials of chemicals from the package, he was throwing open a new way of thinking about cancer. Sydney Farber's package of chemicals arrived at a pivotal moment in the history of medicine. In the first quarter of the 20th century, cancer had overtaken the three common deadly diseases—typhoid fever, smallpox, and tuberculosis—to become the second most common killer, just behind heart diseases. Although new miracle drugs appeared at an astonishing rate after World War II in the late 1940s, no effective drugs had been found for cancer. To cure cancer, doctors had only two options: incising it with surgery or incinerating it with radiation. Proposals to launch a national response against cancer had ebbed and flowed in America since the early 1900s. In May 1937, cancer was magnified in the public eye again thanks to cancer articles appearing in the Fortune, the Life, and the Time magazines. The U.S. government held a joint Senate-House conference in June to draft legislation to address the issue. On August 5, President Roosevelt signed the National Cancer Act of 1937, creating a new entity called the National Cancer Institute (NCI) to coordinate cancer education and research. But World War II had shifted the nation's priority from cancer research to the war. The promised funds from Congress never materialized, and the NCI languished in neglect. The social outcry about cancer also drifted into silence. IF A CURE for leukemia could be found, Farber reasoned, it would be within hematology—the study of normal blood. In 1928, a young English physician named Lucy Wills discovered thatfolic acid, a vitamin-like substance in fruits and vegetables, could restore the normal genesis of blood in nutrient-deprived patients. Farber wondered whether folic acid could restore the normalcy of blood in children with leukemia. But as he injected synthetic folic acid into a cohort of leukemia children, Farber found that folic acid sped up the growth of leukemia rather than stopping it. He stopped the experiment in a hurry. But Farber was intrigued by the response of the leukemia cells to folic acid. What if he could find a drug to suppress folic acid—an antifolate? Farber's supply of folic acid had come from the laboratory of an old friend—a chemist called Yellapragada Subbarao or Yella. Yella was a physician turned cellular physiologist. Having finished his medical training in India, Yella could not practice medicine in America because he had no license. He started as a night porter at a hospital, switched to a day job as a biochemist, and then joined the Lederle Lab in 1940. With a slight alteration of the recipe, Yella created multiple variants of folic acid, some of which behaved like antagonists to folic acid. In the late summer of 1947, Yella sent the first package of antifolates to Farber. On August 16, 1947, in the town of Dorchester in New England, a two-year-old boy named Robert Sandler was brought to Children's Hospital in Boston. He had been ill with a wax and wane fever for over two weeks. The condition had worsened. His spleen was enlarged, and his blood sample had thousands of immature lymphoid leukemic blasts. His twin brother, Elliot, was in perfect health. Farber had received the first package of antifolates from Yella a few weeks before Sandler's arrival. On September 6, 1947, Farber injected Sandler with pteroylaspartic acid or PAA, the first of Yella's antifolates. But PAA had little effect. On December 28, Farber received a new version of antifolate—aminopterin. He injected the boy with it. The response was remarkable. The white cell count stopped its astronomical ascent, hovered at a plateau, and then dropped. And the leukemic blasts gradually flickered out in the blood and then disappeared. By New Year's Eve, the count had dropped to one-sixth of its peak value, bottoming out at a near normal level. The cancer hadn't vanished, but it had temporarily abated. Sandler's remission was unprecedented in the history of leukemia. Farber treated the slow train of children with childhood leukemia arriving at his clinic. An incredible pattern emerged: antifolates could destroy leukemia cells and make them disappear for a while. But the cancer relapsed after a few months of remission, refusing to respond to even the most potent of Yella's drugs. Robert Sandler died in 1948. In June 1948, Farber published his study in the New England Journal of Medicine. The paper was received with skepticism, disbelief, and outrage. The obliteration of an aggressive cancer using a chemical drug was unprecedented in the history of cancer. We assume that cancers in humans are diseases caused by industrialization and modern lifestyles, but studies showed these diseases occurred thousands of years before modern industrial societies existed. The world's first medical description of cancer was discovered in Egypt and dates back to about 2500 BC. It's called the Edwin Smith Papyrus, an ancient Egyptian text named after the dealer who bought it in 1862. The papyrus is a copy of the collected teachings of the great Egyptian physician Imhotep who lived around 2625 BC. It describes 48 cases of injuries, fractures, wounds, dislocations, and tumors. Every case is followed by a concise discussion of treatments. Case forty-five describes breast cancer as a "bulging mass in the breast", for which there is no cure. Around 440 BC, the Greek historian Herodotus recorded in The Histories that Atossa, the queen of Persia, had a tumor upon her breast. She sought a self-imposed quarantine and ultimately allowed Democedes, her Greek slave, to cut off the tumor. Besides historical descriptions, there is also evidence of cancer in mummified specimens of malignant tissues of cancers that had somehow preserved from ancient times. In 1914, a team of archaeologists found a tumor on a two-thousand-year-old Egyptian mummy. In 1990, Arthur Aufderheide, a paleopathologist, found cancers in naturally desiccated mummies in a thousand-year-old gravesite in the southern tip of Peru. The most striking finding, though, is not that cancer existed in the distant past, but that it was rare. In ancient times, people didn't live long enough to get cancer because cancer is a disease of older people, with incidence rates increased with age for most cancers. Around 400 BC, a word for cancer appeared in the medical literature. The great Greek physician Hippocrates (460-370 BC) used the wordkarkinos to describe malignant tumors because the finger-like spreading projections from such tumors reminded him of a crab. 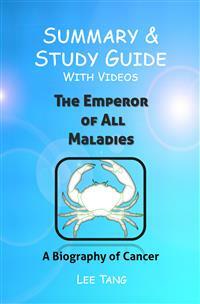 The Romans later translated the Greek term into cancer, the Latin word for crab. Two centuries later, another Greek physician named Claudius Galen (AD 130-200) used the word oncos (the Greek term for swelling) to describe tumors. It is the origin of the word oncology, the study of cancer.